The Central Bank's annual report on foreign reserves showed positive performance in 2018 compared to 2017. "Foreign reserves grew by 32.6 percent, driven mainly by the positive difference between the Bank's purchases of dollars from the Ministry of Finance and its sales through the foreign currency sale window, as well as the profits from portfolio revenues," a source at the bank said in a statement. Investment in various segments. " "At the portfolio level, the portfolio grew by about 25 percent in 2018 by 2017 as a result of the positive difference between the central bank's purchases and sales of the US dollar, as well as the conversion of a large portion of other currencies due to maturity Some investment instruments and returns to the US dollar. " "The gold segment has increased in value in 2018 by about 6 percent than in 2017, as a result of increased investment in this asset, and the gold reserves of the Central Bank of Iraq by about 96 tons in 2018. Iraq ranks fifth in the Arab world and 37th in the world in terms of gold reserves. Iraq was one of the largest buyers of gold in 2018, along with India, China and Kazakhstan. 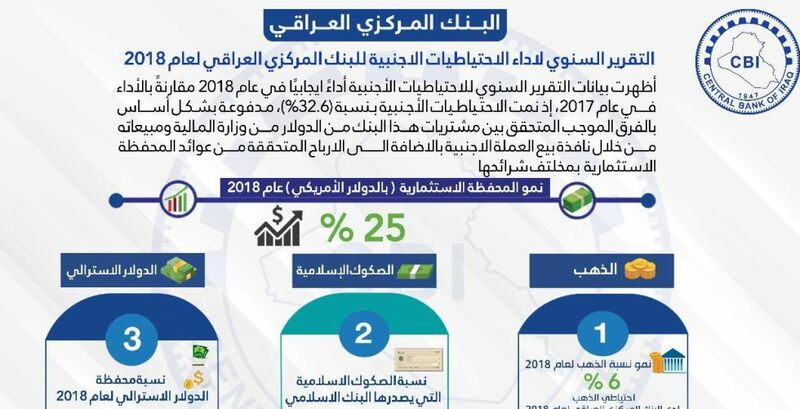 "Investment in Islamic bonds issued by the Islamic Development Bank in 2018 increased by more than 33 percent in 2017," he said. While the portfolio in the Australian dollar in 2018 rose by about 1.6 percent compared to 2017, due to the increase in returns on deposits added to the original balance of deposits.